In reconstructing fragmented bones of Neandertal children, evolutionists assume that rates of development were equal to or faster than modern children. Belief in faster development, or earlier maturation, arises from viewing Neandertals as more primitive, or more ape-like than modern humans. However, a detailed re-examination of the skull fragments and available teeth of four juvenile Neandertals—the Pech de l’Aze, the Gibraltar child, the Engis child and the Le Moustier youth—reveals that Neandertal children did not develop like apes and were most likely slower in development than children today. This is consistent with the biblical record of longevity in ‘early man’ and is thus very likely due to delayed maturation in early post-Flood people. Many Christian scholars have ‘bought’ all of the evidence that the evolutionary community has produced. As a result of this non-critical and somewhat naive acceptance of data, many Christian colleges teach macroevolution in their science departments. Should the anthropological community that has a vested interest in neo-Darwinian evolution be trusted to disseminate scientific facts untainted by evolutionary assumptions? The reader may decide on the basis of my personal investigations. Over the past 14 years I have been collecting palaeoanthropological data in the museums and universities of the world. It soon became obvious that a definite pattern was developing as I travelled from one collection to the next. It appeared as if the palaeoanthropologists had made a concerted effort to adhere to a rigid uniformitarian viewpoint in relation to the growth, maturation, and aging process in ancient populations no matter what the evidence showed. The assumption that undergirds this position is that the present is the key to the past. In the study of children of ancient history, this axiom requires that their rates of growth and development be equal to or faster than modern children. Equal to, because of the present to past assumption, and faster, because of the supposed primitive ape-like heritage. Never, never, could it be presumed that children developed slower in ancient times—perhaps because that is too close to the account found in Genesis and that would be another faith. This was stated by Franz Weidenreich in 1949. Weiss and Mann in 1985 echo the same sentiments. Man has a tendency towards orthognathism (straight face), while the ape is prognathic (protruding face). Many humans have prognathic faces. None, however, are as prognathic as the chimpanzee, orangutan, gorilla or gibbon. These two basic false assumptions, plus creative imagination, I believe, have been the source of all the problems in the reconstruction of fossil men and fossil apes. Figure 2. 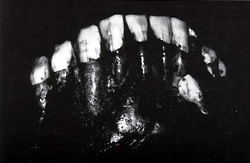 Original cephalometric radiograph (lateral view) of Pech de l’Aze, showing teeth in good occlusion (normal bite) and lower jaw fitting into skull. Cephalometric radiograph is a measurable 8 x 10 inches (about 20 x25 cm) x-ray. Figure 3. The actual fossil skull and lower jaw of the Pech de l’ Aze infant as it sits in the headholder for taking of the radiograph. Grossly maloccluded means that the teeth did not fit together in a good occlusion (bite). Since Neandertal adults had very protruding faces and jaws it was believed that the children’s faces were similarly protruded. 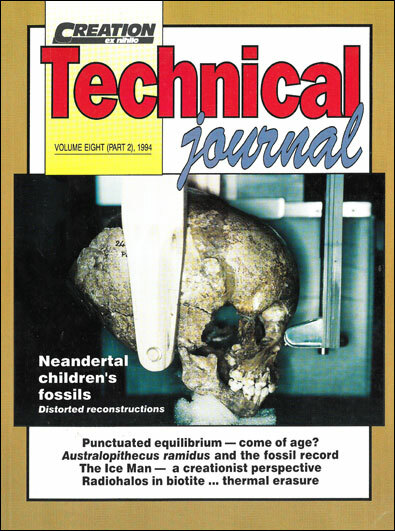 Howell thought that the distinctive shape of the head and face of the classic Neandertal group of which Pech was a member began at an early age and was the result of a special pattern of growth and development.5 So, everyone thought it was natural for Neandertal children to have miniature adult faces. 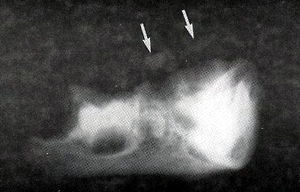 The cephalometric radiographs (x-rays) which were taken of Pech showed that contrary to current opinion, the facial structures of this supposedly 2.5 year old child were retruded (backward positioned) and not protruded in relation to a plane of reference in the head called the Bolton Plane.8 (See Figure 4.) 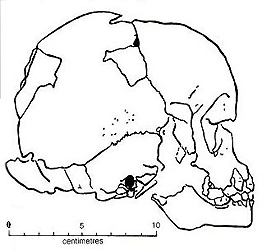 When comparisons are made to modern day children in Figure 5 it is seen that the lower face of Pech is less forward than even the modern one year old. This facial retrusion for a Neandertal child certainly does not fit the facial reduction theory. 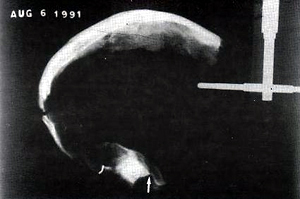 The only accurate measurement of the length of the head (cranium) of this child (because the back of the head was broken) is a line drawn from Nasion (point between nose and forehead) to Basion (point on base of skull) in the cephalometric radiograph. It measured 85.42 mm. The modern three year old is 82.47 mm. 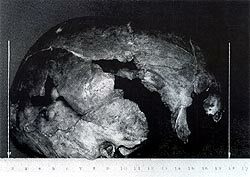 The base of the Pech skull is slightly larger than a modern three year old. Another significant finding was the steep (14°) angulation of the hard palate (roof of mouth) of the upper jaw to a straight line drawn from below the eye to the external opening of the ear canal. By the time a modern child has reached two years of age his or her hard palate is parallel with this eye-ear plane (Frankfort Horizontal Plane). The impression one gets from looking at this little child is that the face is extremely wound-up in a clock-wise direction ready to unwind in a long growth period. At what level of maturity did this child die? One clue comes from a comparison of Pech to the modern nine to 12 week old human embryo, which shows a very similar angulation of the hard palate structures.9 Since there is a conflict between the size of the head and face, the question now becomes: Are the face and teeth delayed in growth in relation to the head? Before this is answered, let us examine some other Neandertal children. A comparison of the tracing of the Pech child’s radiograph compared to those of normal modern day children from the Bolton study. 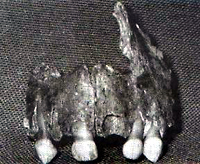 The Pech jaws and upper and lower front teeth (dotted lines) are further back than even the typical modern American one-year old jaws (a). Modern one (a), two (b), and three year olds (c) are more protruded (forward positioned) in both jaws than Pech. Diagonal plane is the Bolton Plane from the nasion point (nasal bones meet frontal bone) to the Bolton point (highest point in the retrocondylar fossa in the midline). This point is estimated based on the position of the anterior rim to the foramen magnum and related cranial base structure. For even the modern one year old to have the same forward position of the upper and lower jaw as Pech, the Bolton Plane would have to be tipped up at the back end and the actual Bolton point would then be superior to my estimate by 10 mm, which would put it 4 mm above the auditory canal (ear rods). Any anatomist knows this is an impossibility, even for the Neandertal who had a flatter cranial base than modern man. If the actual Bolton Point is any lower than my estimate the retruded position of Pech’s jaws becomes much more retruded. So this is an extremely safe estimate. The form of the nose and forehead in each comparison belongs to a modern day child. Figure 6. 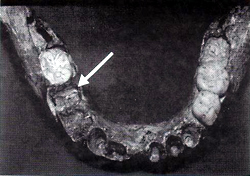 The lower jaw of the child from Gibraltar. On the right side there is an arrow pointing to an empty tooth socket. The middle tooth on the left side of the jaw is the same size as the tooth that was supposed to fit in this empty socket. Obviously it wouldn’t fit. Garrod was applying the rigid uniformitarian assumption that the modern day eruption time of the first permanent molars has always been the same throughout history. It has always been in the sixth year. Is this true? According to Garrod this fact made the Gibraltar child five years old. I examined the Gibralter child’s upper and lower jaws in the British Museum in London, England. For some unexplained reason I was not allowed to see the skull-cap, or the bones of the ear. However, in the lower jaw I was able to discover an error in reconstruction that would have made a difference in the determination of its age if tooth levels were not allowed to dictate the conclusion. In Figure 6 the lower jaw shows two primary molars and one unerupted first permanent first molar on the left side. These teeth are absent on the right side. On the right side an artificial tooth has been put in place of the first permanent molar. 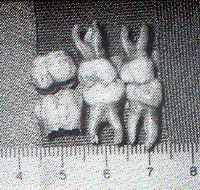 There has been a break through the jaw, on the right side, in the socket of the second primary molar (see Figure 6). We know this socket has been compressed because if the left second primary molar on the other side (middle tooth) was moved over to the right, it could never have fitted into this position. The back piece of bone (ramus) has been rotated outward so that the artificial tooth (first permanent molar) has its top surface facing straight up. Notice the wide whitish outer edge of the compressed socket. That’s the leading edge of the rotated back piece. Figure 7. 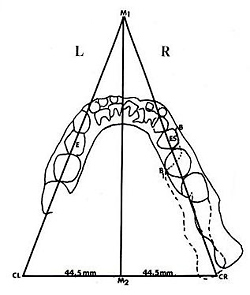 Diagram of the lower jaw of the Gibraltar child. The line from M1 to M2 is the midline which usually divides the jaw in two equal halves. CL is the point where the left condyle (knob at end of jaw) should be and CR is the point where the right condyle should be. The dashed line outlines the correct position of the broken piece of the right side of the jaw. The solid line is the actual position. B to B1 is the break line. ES is the empty socket. E is the tooth that should fit in ES. The distances CL to M2 and CR to M2 are 44.5 mm ± [plus or minus] 1 mm. The actual position (solid line) is about 10 mm too far from the midline. Figure 7 is a diagram showing the extent of the movement of the right broken piece. The midline M1 to M2 divides the lower jaw in half. In most cases both sides are supposed to be approximately equal distances from this line. Certainly not all lower jaws are bilaterally symmetrical, but the broken and compressed socket casts a shadow over this alignment. Moreover, if an attempt was made for symmetry, the distances between CL and M2, and CR and M2, would be the same—44.5 mm. But they aren’t, and the broken piece (ramus) has been pushed out about 10 mm and probably rotated forward 7–8 degrees. Most physical anthropologists know that a very young lower jaw shows a tipping in (toward the midline) and a tipping back of the condyle and upper part of the ramus. This imaginative adjustment in reconstructing the fossil jaw made it appear older, even though it was still small in comparison to a modern five year old. Figure 8. Radiograph of the side view of the Gibraltar child lower jaw. The two primary teeth that are erupted on the left side show large pulp spaces. These are called taurodont teeth, meaning bull-like. They are designed for longer and tougher wear. They show a lot of enamel wear. All Neandertal children I examined have taurodont baby teeth. She almost came to the conclusion that more than five years were necessary for the brain case to grow this large, even though the teeth only appear five years old. She almost broke away from the uniform tooth eruption schedule and followed the evidence. However, I think she knew that the evidence was leading to a child who had lived longer, had more tooth wear than five years and was maturing and growing very slowly. Figure 9. The Engis child upper jaw. Two empty sockets show where two primary teeth were lost after death. They would show signs of filling in with bone if the teeth were lost during life. The presence of four primary teeth at presumably a six to seven year age level gave Fraipont his idea of the age of this child. Figure 10. The Engis child’s four primary molars in normal occlusion (bite) show small amounts of resorption (erosion) of the root tips, but the most significant feature here is the very small amount of root development of the lower first permanent molar (last tooth on the left in lower row). This root stage indicates an age of three years plus a couple of months according to the most recent standards (Morrees et al.—see references). Notice also the excessive wear to the first primary (deciduous) molars (right); in particular, the degree to which the cusps have been ‘eroded’ (advanced cuspal attrition) when compared with the second deciduous molars (centre). This suggests a protracted eruption phase. Figure 11. The Engis frontal bone (forehead) in close-up view. 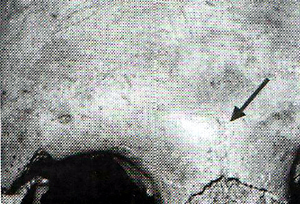 Above the serrated edge of the frontonasal suture (joining line of the nasal bones and the frontal [forehead] bone) is the slightly raised glabellar protrusion of bone which is more pronounced in the older Neandertals (see Figure 17). This section of raised bone is often associated with a frontal sinus under it. It also forms an expanded V-shaped connecting link for the two ridges of bone over the orbits (eye sockets) called supra-orbital brow ridges. This protrusion of bone demands greater time than 3–5 years to develop, unless of course, you relate it to the ape and call it accelerated. But why did he do this? Perhaps loyalty to the ape cause requires such things. Figure 12. 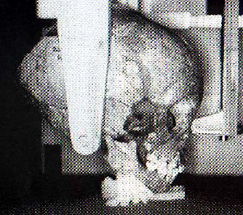 True lateral view of the Engis child cranium (skull). The ruler is resting under the skull so as to provide an accurate measurement in millimetres. Perpendicular lines from the ruler to the anterior (front) and posterior (back) of the skull show the maximum length to be from the 15 mm mark to the 179 mm mark. Total length equals 164 mm. He didn’t attach much significance to this finding, which was similar to Garrod’s position on the foetal characters of the Gibraltar child. Instead, he stood by the teeth which he called, ‘semblable à celui de l’enfant actuel.’ Translation: Similar to that of today’s child. Once again, this changing of facts because of assumptions is not science. It mandates acceleration of the head even if it means adding 24 mm, and flies in the face of a thoughtful assessment of all the evidence. 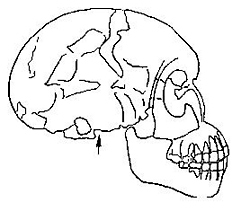 Figure 13.Original construction of Le Moustier cranium (skull) facial and jaw bones, as taken from the article by Klaatsch and Hauser in 1909 (see references). Figure 14. A reconstruction of Le Moustier on paper based on my cephalometric radiographs. Each of the four pieces was traced and fitted together based on anatomical relationships: condyle in TM fossa, teeth in maximum centric occlusion (best bite according to normal cuspal patterns), normal Neandertal nasal airway (based on calculations of Pech de l’Aze, La Chapelle-aux-Saints, La Ferrassie 1, from the same area in France). The fourth Neandertal child I will consider for this paper is the older youth from Le Moustier. I examined and radiographed this fossil in Berlin, Germany, in the Museum für Vor- und Frühgeschichte. This youth has been designated as a male between the ages of 15 to 18 years. The skull and facial bones were broken and separated by a bomb explosion in the museum during World War II. I have recently made my x-rays available to the present museum anthropologists at their request in an attempt to put the skull and face together properly. It is to their credit that they are now trying to put it together correctly. Figure 15. The official museum version of Le Moustier in the glass display case on the first floor of the Museum für Vor- und Frühgeschichte in the West Section of Berlin. Figure 13 shows the original construction by Klaatsch and Hauser from their article in 1909.29 Figure 14 is a reconstruction based on my radiographs. 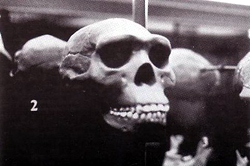 Figure 15 is a very ape-like reconstruction from a photograph of the official exhibit in the museum display case for the public to view. Figure 16 is a drawing from the slide of Le Moustier which was purchased from the museum souvenir counter. It is not difficult to see that there are great differences in these four versions of Le Moustier. Figure 17 is my radiograph of the frontal bone (forehead), which shows that it would look almost like a modern one if aligned in this upright position. Compare the museum exhibit forehead (Figure 15 [apelike]) and Figure 17. Check Figure 14 to see how it appears upright and how well it fits into the side of the skull (temporal and parietal bones). Look at the jaws in the drawing of the souvenir museum slide (see Figure 16). Both upper and lower jaws are very forward of the modern human range of normal. Carefully examining the position of the lower jaw, it is seen that the condyle or knob at the end of the lower jaw, which fits into the fossa of the skull (arrow), is not sitting in the fossa (cup-like indentation), but is about 30 mm forward in the temple or infra-temporal area. The lower jaw would be dislocated if this were its normal position. Figure 16. A drawing of the Le Moustier colour slide which was purchased at the counter of the museum. The lower jaw is about 30 mm forward of the TM fossa, which makes the upper jaw also 30 mm forward and very ape-like. An arrow points to the TM fossa. Figure 18 is a radiograph of the side of the head, and an arrow points to the fossa of the temporal bone where this condyle is supposed to fit. The lower jaw in Figure 16 is so far out of the joint area that the ligaments which attach it to the back of the fossa would be stretched beyond their elastic limit. Having the two jaws in this position gives this version a decidedly ape-like appearance, and also makes the jaws somewhat similar to the adults. Figure 19 is a view that shows the crushed nature of the Le Moustier chin. It has been reconstructed as being flat with no curvature or elevation of the modern chin. This certainly fits the chinless assumption taken from the ape heritage assumption, but is it correct? In the study of the other three children, their chinlessness could very well be due to infantile characteristics and small jaws. By the time a Neandertal youth like Le Moustier should have acquired a chin, all that can be found is a broken one. Once again, assumptions and imagination dictate reconstruction. I believe that the authoritarian rule of assumption which determines the reconstruction and interpretation of fossils has allowed imagination to twist the objectivity of palaeoanthropology. Infantile characteristics and evidence of delayed growth patterns have been suppressed. Great license has been taken in the reconstruction of the fossil evidence. What are we to make of all this? Figure 17. 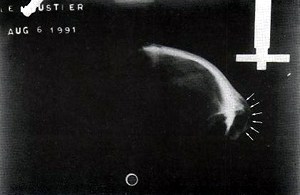 Radiograph of Le Moustier frontal bone (forehead). The exterior wall of the frontal sinus is outlined with white arrows. This sinus is larger than would be expected in a 15–18 year old modern youth. Figure 19. The crushed chin of Le Moustier. There is no way of telling from this broken chin whether it really is as flat as this or protruded like a modern chin. My radiograph of La Ferrassie 1 shows a protruded chin, so I would think that Moustier had a similar one as well. Figure 18. Radiograph of the right side of Le Moustier cranium taken with the cephalometric method. Partial bones included are the temporal, parietal, occipital and sphenoid. Arrow points to the TM fossa where the lower jaw should articulate (fit in a hinge position). Ear ring (light circle) is in the external ear opening. Millimetre ruler is visible on right side. The obvious conclusion from this bony evidence is that Neandertal children did not develop like apes and were most likely slower than children of today. In addition, I must add that there have been reports on children of recent history which indicate a slower pattern of growth and development in the past.30,31 This whole topic is fascinating; as my book [Buried Alive: The Startling truth about Neandertal man] discusses, many of the ‘archaic’ features of some strains of ‘early man’ are very likely due to delayed maturation in early post-Flood people who still had (as the Bible record indicates) significantly longer lifespans than today. Finally, it seems to be the prevailing practice among palaeoanthropologists that the ape heritage assumptions of neo-Darwinian evolution dictate the construction and interpretation of fossils. Then the construction or new interpretation is turned around and used as a fact to prove the validity of neo-Darwinian evolution. This is circular reasoning. Much has been said about the presence of transitional fossils to prove that man evolved from an ape-like creature. This paper describes how at least some of these have been made. There is much more to be done and I encourage anyone who has a desire for truth to seek out these original fossils if they are allowed to see them. I would also like to request the open-minded scientists, who believe neo-Darwinian evolution to be fact, to open their museums to independent investigators so that science may do what science is supposed to do and be objective. Since 1989, I have had an official request and application for permission to examine the fossils of the National Museums of Kenya. I was accepted by the Office of the President on 6 November 1990, and as I prepared to go and was raising funds for the project, I received a letter on 5 March 1991 stating that my study was no longer permitted. Succeeding letters proved futile in that the museum people refused to grant permission. So much for openness! Dr John (Jack) Cuozzo has been a practicing orthodontist for 28 years in Glen Ridge, New Jersey (USA). He received his D.D.S. from the University of Pennsylvania School of Dentistry in 1962. He served for two years as a dental officer in the U.S. Navy before graduating in 1966 from Loyola University of Chicago with an M.S. in oral biology and a Certificate of Speciality in orthodontics. He is currently also the Assistant Director of the Dental Department, Mountainside Hospital, Montclair, N.J. Jack has done extensive research in palaeoanthropology in many countries with the original fossils, as reported in this paper. Figures 2 and 3—taken with permission of the Musée de l’Homme, Paris, France. Figures 6 and 8—taken with permission of The British Museum, London, England. Figures 9, 10, 11 and 12—taken with permission of The University of Liège, Liège, Belgium. Figure 15, 17, 18 and 19—taken with permission of the Museum für Vor- und Frühgeschichte, Berlin, Germany. Weidenreich, F., Trends of Human Evolution, Viking Fund Memorial Volume, Washburn and Wolffson, New York, p. 9, 1949. Weiss, M. L. and Mann, A. E., Human Biology and Behavior, An Anthropological Perspective, 4th Edition, Little Brown and Company, p. 313, 1985. Patte, E., L’Enfant de Pech de l’Aze, Neandertal Centenary, Wenner-Gren Foundation, Utrecht, Netherlands, pp. 270–276, 1958. Ivanhoe, F., Was Virchow right about Neandertal? Nature 227:577–579, 1970. Howell, F.C., The evolutionary significance of variation and varieties of Neandertal man, Quarterly Review of Biology 32(4):330–347, 1957. Cuozzo, J.W., Earlier orthodontic intervention: A view from prehistory, Journal of New Jersey Dental Association, Autumn, 1987:33–40, 1987. Broadbent B.H. et al., Bolton Standards of Dentofacial Development Growth, The C.V. Mosby Co., St Louis, 1975. Patten, B.M., Human Embryology, 3rd Edition, Blakiston Division, McGraw-Hill Book Company, New York, New York, 1968. Garrod D.A.E. et al., Excavation of a Mousterian rock-shelter at Devil’s Tower, Gibraltar, Journal of the Anthropological Institute of Great Britian and Ireland 58:33–91, 1928. Morrees, C.F.A., Fanning, E.A. and Hunt, E.E., Age variation of formation stages for ten permanent teeth, Journal of Dental Research 42:1490–1502, 1963. Fraipont, Charles, Les hommes fossiles d’Engis. Archives De L’Institut De Paléontologie Humaine, Memoire 16, Masson et C, Editeurs, Paris, 1936. Morres et al., Ref. 17. Klaatsch, H. and Hauser, O., Homo mousteriensis hauseri, Archiv für Anthropologie, Völkerforschung und Kolonialen Kulturwandel, 35:287–297, 1909. Whyshak, G. and Frisch R., Evidence for a secular trend in the age of menarche, New England Journal of Medicine 306(17):1033–1035, 1982. Tanner, J.M., Earlier maturation in man, Scientific American 218:21–27, 1968.